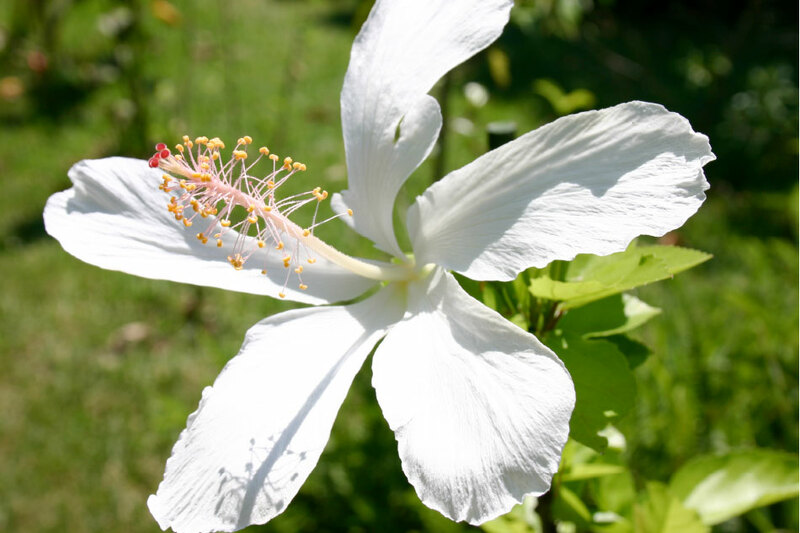 Aloalo is the name given for hibiscus in general. Hau is an introduced hibiscus (Hibiscus tiliaceus), perhaps by early Hawaiians. Hau hele literally means “traveling hau.” Kokiʻo kea and Kokiʻo keʻokeʻo literally mean “white kokiʻo” and “white, white [clear white] kokiʻo,” respectively. Pāmakani is a name given to this species of hibiscus and also to a native violet (Viola chamissoniana). The two native Hawaiian white hibiscuses, Hibiscus arnottianus and H. waimeae, are the only species of hibiscuses in the world known to have fragrant flowers! Two cultivars are recognized for this subspecies: cv. ‘Molokai White’ and cv. ‘Nuuanu White’.